Together in combat and in the studio, these two veterans are living their musical dream of creating hip hop music for the world. 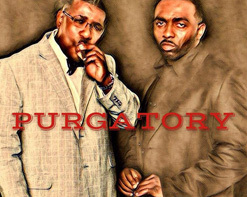 Conscience Rhyme from Miami and OP-Solo from Chicago create the talented rap duo Purgatory. During 21 years of active duty, including serving admirably in Operations Iraqi Freedom and Enduring Freedom, Conscience Rhyme aka Crhyme and OP-Solo aka Optimus Rhymez blended their lyrical stylings and memorable beats to create pure unadulterated music free from profanity, conformity, or mediocrity. The hip hop duo’s new video for their single “Let Me Love You,” featuring Georgia based singer Teeya Skipper, is all about positive feelings. The Atlanta skyline shining in the background is alternated with darkly colored cool romantic hotel rooms where two girls each invite their lovers inside for an affectionate night. OP and Conscience rhyme about love, commitment, and keeping it real with their significant others, with Teeya’s sensual and airy voice bringing a romantic gesture to this R&B hip-hop ballad. This video inspires both the warm feeling and the sensual essence of love. We hope viewers and programmers enjoy this incredibly well-crafted video as much as we did here at HIP video promo! Please let us know what we can do to get “Let Me Love You” feat. Teeya Skipper into your programming! For more information please contact Andy Gesner and the HIP Video Promo team at (732)-613-1779 or email us at info@HIPVideoPromo.com.